This Saturday, Taiwanese singer Show Lo will be holding his "2010 Wu Fa Wu Tian Shanghai Concert" at the Shanghai Hong Kou Soccer Stadium. As reporters have it, besides actively doing physical training in Taipei to prep for the concert, Show Lo is also conferencing with May Day, his guests for the upcoming Shanghai concert. A popular artist working with a popular band will surely tear up Hong Kou Soccer Stadium on Saturday night, only bringing the excitement to its most climactic peak. As reports have it, having being used to working with other pop queens, Show Lo is trying out something new this time around. Considering his focus in dnace and May Day's focus in rock, these two different genres can come together and spark new chemistry. But because May Day is a highly praised and popular band of Asia, Show was worried, at first, that due to their own tour that they wouldn't have the time to make it. But unthinkably, he called them and the leading vocal Ashin immediately agreed to it. However, due to May Day's packed touring schedule, so as to not interfere with their performances, Show Lo only chose to discuss concert details with May Day over the phone and email. After a few days of sending emails back and forth, the two parties finally came to the agreement of performing May Day's classic "Leaving the Earth's Surface." 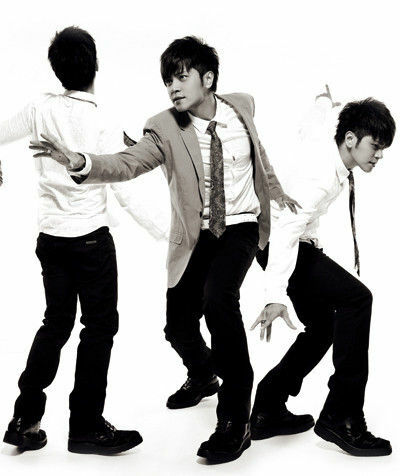 And as support to their bro Show Lo, May Day will be rearranging it to a version that has never been performed before. Aside from that, May Day will also be singing a song "Zhi Zu (Enough)." After May Day's concert ended in Taichung on 07/24, they had their first rehearsal together. Show also expressed that he hopes that with the addition of May Day, his concert would bring Shanghai a dazzling spectacular on a summer night. Hier j'ai encore rêver de lui!!! Yesterday i dream again about him!!! 昨晚梦到他了!! !